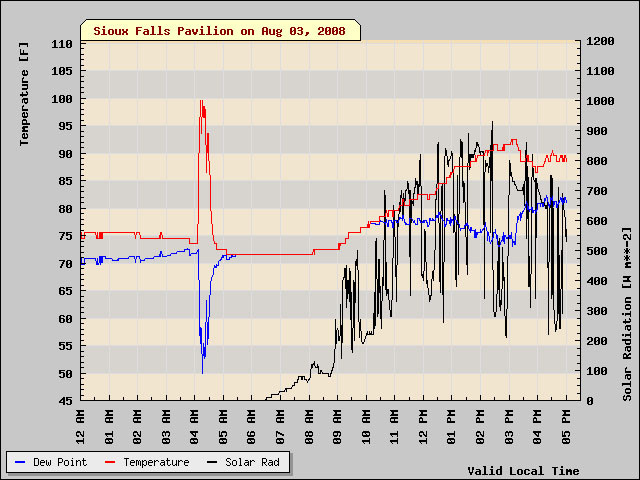 Temperature and dewpoint graph from the dramatic heat burst in Sioux Falls in 2008. Heat bursts are rare and intriguing phenomena where air temperature spikes suddenly and dramatically. They are most common at night or during the early hours of the morning. These spikes are often accompanied by severe wind gusts and significant drops in dewpoint (which means the air is drying out significantly). Typically temperature jumps are roughly ten degrees in less than 30 minutes, but extreme cases have been reported. At 3 a.m. on July 11, 1909, the temperature spiked to 136 deg F over a small area south of Cherokee, Oklahoma. Crops were said to have instantly desiccated. Great Falls, Montana experienced a spike of +26 deg F in 15 minutes in the pre-dawn hours of September 9, 1994, topping out at 93 deg F and matching the record high for that day. The temperature was back down to 68 deg F just 20 minutes later. Two of the most well-documented heat bursts took place in Sioux Falls, South Dakota on August 3, 2008 and Wichita, Kansas on June 9, 2011. In Sioux Falls, the temperature rose from 74 deg F to 101 deg F in a matter of minutes in arguably the most dramatic heat burst ever reliably documented. 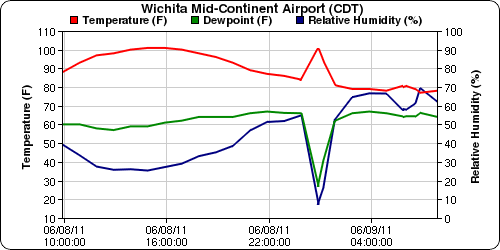 Three years later in Wichita, the temperature went from 85 deg F to 102 deg F in 20 minutes between 12:22 a.m. and 12:42 a.m. This event was recorded by both the National Weather Service and numerous amateur weather stations in the Wichita area. Temperature graph from the Wichita heat burst of 2011. This was a more prolonged event than the one that hit Sioux Falls three years earlier. This story has been told many times and is often repeated in local newspaper articles on anniversary events and in articles posted about heat bursts. How much truth there is to the story is not clear. It was first published in a book about Texas weather by meteorologists Harold Taft and Ron Godbey from the NBC station in Dallas in 1975 and likely comes from local records and community tales. As with many oft-retold stories, over time, legend begins to replace facts. As the old saying goes, “everything gets better in the retelling.” It certainly seems that something dramatic happened there that night, however there is no record in the National Weather Service database of a severe wind event in Bosque County that night (although there was a tornado reported in far north Texas near the Oklahoma Panhandle that afternoon). What is definitively clear is that in the days that followed, a major heat wave struck that area of Texas. A graphical depiction of how a heat burst occurs. Other wild stories of heat bursts have come from abroad. Near Lisbon, Portugal, the temperature supposedly rose from 100 deg F to an insane 158 deg F in two minutes on July 6, 1949. In Abadan, Iran, in June of 1967, a ridiculous shade temperature of 188 deg F was reported. Dozens of people supposedly fell dead and the streets and asphalt roads liquefied. These reports are likely both apocryphal. A report of 152 deg F from Turkey in 1977 also seems dubious. There is more support, however, for a report from Kimberley, South Africa of a 43 degree spike in just five minutes during a squall. The report comes from an observer at a local weather station but may be the result of faulty equipment. A significant heat burst likely did occur, however. At Gretna, Manitoba in Canada, there were two successive heat bursts in the early morning hours of July 21, 1960. The temperature spiked 16 degrees Fahrenheit in 15 minutes between 12:25 a.m. and 12:40 a.m. Then, just an hour and a half later, another, even stronger heat burst occurred, surging from the 70’s to 97 deg F also in just 15 minutes. Just last year, in January of 2014 in Melbourne, Australia, the temperature rose from 86 deg F to 102 deg F in roughly an hour. At the same time at the nearby Cerberus naval base, the temperature rose from 76 deg F to 90.5 deg F in just 30 minutes. This animation shows a traditional “wet” downburst, which is far more visible and gives a good depiction of how powerful these events are. A downburst is a blast of wind caused by the downward surge of air as a thunderstorm collapses, frequently accompanied by heavy rain. 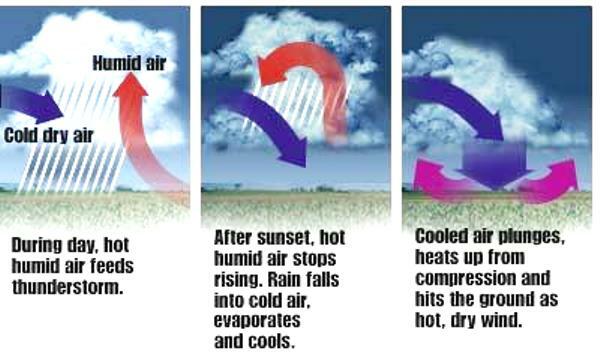 When you have hot, dry air in the mid-levels above the surface, there’s no moisture to evaporate to cool the air and what happens is something called “compressional heating.” When air sinks down, it increases in density and causes compression of the molecules in the air, which generates heat. Normally this is offset by evaporating moisture, which has a cooling effect (this is what happens to your body when you sweat). However if there’s no moisture to evaporate, this cooling doesn’t occur. So, not only is the much warmer air aloft thrust down to the surface by the downdraft, the heat is dramatically increased because of the compression effect. This what causes a heat burst. This situation is most common in desert environments, where heating is stronger and that warm, dry layer in the mid-levels is seen more often. This entry was posted in Uncategorized and tagged climate, extreme weather, heat, science. Bookmark the permalink.